Old times certainly are not forgotten in some parts of the South. Two private Mississippi academies, set up in 1968 for white children facing the unacceptable (to their parents) prospect of sharing their classrooms with African Americans, are still being enthusiastically funded by white supremacists. Calhoun Academy in Calhoun City, Miss., and Carroll Academy in Carrollton, Miss., have been the beneficiaries of considerable financial support the past two decades from the Council of Conservative Citizens (CCC), a crudely white supremacist group whose website has referred to blacks as “a retrograde species of humanity” and whose newspaper, Citizens Informer, regularly publishes articles condemning “race mixing” and lamenting the purported decline of white, European civilization. 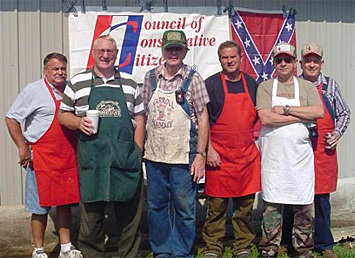 The CCC is the direct descendant of the segregationist White Citizens Councils, using the earlier councils’ mailing lists to build its membership. The Supreme Court’s landmark 1954 decision, Brown v. Board of Education, ordering desegregation of the nation’s public schools, sparked the growth of the White Citizens Councils, whose propaganda read, “We will not be integrated. We are proud of our white blood and our white heritage of sixty centuries.” The councils’ first order of business after the decision was to create private, all-white schools that came to be known as segregation, or seg, academies. By 1975, at least a half million white students had withdrawn from public schools to avoid mandatory desegregation. The Carroll and Calhoun academies, both of which offer classes from kindergarten through high school, are revered by the CCC. The CCC’s longtime national field coordinator, Bill Lord, who was president of Carroll Academy for 14 years in the 1980s and 1990s, called them “the miracle of the century.” In 2004, Lord wrote in the Citizens Informer that the academies create “an atmosphere free of social experiments” for those who want to “associate with persons of like persuasion,” presumably meaning other whites. According to his biographical profile, Lord helped organize Carroll and Calhoun Academy, as well as six others in Arkansas and Tennessee. The CCC works hard to support the schools, holding barbecue fundraisers that bring in substantial donations. In 1999, the CCC reported that it had raised over $100,000 for Calhoun Academy. The group also prominently features activities taking place at the academies in its publications. The CCC’s April-June 2010 Citizens Informer, for example, includes a photo of the Carroll Academy Lady Rebels basketball team, congratulating them for having won a championship. Aligning with the CCC’s love of Old South symbols, the Carroll Academy’s sports teams sports teams are called the “Rebels” and the school’s mascot – featured prominently on its website – is Colonel Reb. The colonel is identical to the mascot the University of Mississippi axed seven years ago because of its connection to the confederacy. Several photos of a recent barbecue fundraiser the CCC held for the school are on the academy’s website, including one that depicts a big CCC banner alongside a confederate flag. Calhoun Academy also gets considerable ink in the CCC’s newsletter. A picture in April-June Citizens Informer shows a massive barbecue pit full of chicken that was sold to help the school. “Tasty B-B-Q benefits Calhoun Academy,” reads the caption. On another page the newsletter notes that the barbecue event brought in over $1,600 for Calhoun, described as a “private school organized by the Council.” A 2004 description of a barbecue fundraiser put on by the local CCC chapter said the funds from “the program are used to purchase textbooks and visual aids for the school library.” These events have been held for nearly two decades for both schools. Given how the CCC has helped out Carroll Academy, it was surprising how unaware headmaster Flemming claimed to be about the group. He told Hatewatch that CCC members have children in his academy and that the group is “supportive of the school.” But he insisted that he was “not informed” about the CCC, even though the group regularly meets on his campus. He refused to condemn their racist views saying that he didn’t want “offend anyone” and that “they have their right to feel how they feel.” Flemming also told Hatewatch that the parents of his school’s one non-white student “have never had a concern” about white supremacists meeting at and funding his academy. Both schools are accredited members of the Mississippi Association of Independent Schools (MAIS), which includes dozens of private academies in Mississippi, Louisiana and Arkansas. A search of the association’s accreditation materials could find no reference to best practices or policies dealing with racism or discrimination. E-mails requesting comment from MAIS regarding its policies and the CCC’s support of Calhoun and Carroll academies were not answered (the association posts no telephone number and only accepts inquiries through E-mail). 11.05.10 Update: I received an email comment today from David Derrick, executive director of MAIS. It reads: "Policies of the Mississippi Association of Independent Schools (MAIS) provide that member schools shall not discriminate in enrollment on the basis of race. Member schools, however, are autonomous in their decisions regarding funding. There are no policies in place that allow for, or require, review of funding sources of member schools." 1.10.11 Update: I received another email today from David Derrick. His organization has asked for and now received "letters from the leadership of both schools stating that they will discontinue any support or funding from the CCC." That means that as of now no MAIS schools have any connections with the CCC.